But what of the worker honeybee who gives up her life when danger threatens her hive? Or the mother bird who, feigning injury, flutters away from her nestful of young, thus risking death at the hands of a predator? How can evolution produce genes for such instinctive patterns of behavior when the owner of these genes risk failing the first test of fitness: survival? A possible solution to this dilemma lies in the effect of such seemingly altruistic behavior on the overall ("inclusive") fitness of the family of the altruistic individual. Linked together be a similar genetic endowment, the altruistic member of the family enhances the chance that many of its own genes will be passed on to future generations by sacrificing itself for the welfare of its relatives. It is interesting to note that most altruistic behavior is observed where the individuals are linked by fairly close family ties. Natural selection working at the level of the family rather than the individual is called kin selection. How good is the evidence for kin selection? 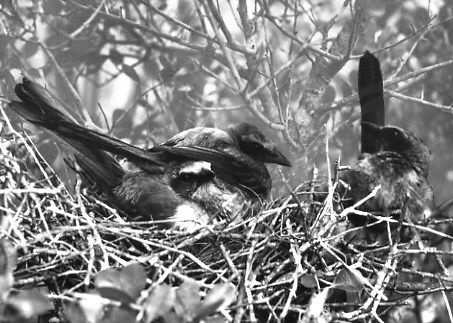 Does the behavior of the mother bird really increase her chances of being killed? After all, it may be advantageous to take the initiative in an encounter with a predator that wanders near. But even if she does increase her risk, is this anything more than another example of maternal behavior? Her children are, indeed, her kin. But isn't natural selection simply operating in one of the ways Darwin described: to produce larger mature families? Perhaps clearer examples of altruism and kin selection are to be found in those species of birds that employ "helpers". One example: Florida scrub jays (Aphelocoma coerulescens coerulescens). These birds occupy well-defined territories. When they reach maturity, many of the young birds remain for a time (one to four years) in the territory and help their parents with the raising of additional broods. How self-sacrificing! Should not natural selection have produced a genotype that leads its owners to seek mates and start raising their own families (to receive those genes)? they have truly sacrificed opportunities to be successful parents themselves. Thanks to the patient observations of Glen Woolfenden, the first point is established. He has shown that parents with helpers raise larger broods than those without. these seemingly altruistic helpers are actually improving their chances of eventually raising larger families than they would have if they started right at it. If so, then once again we are simply seeing natural selection working through one of Darwin's criteria of individual fitness: ability to produce larger mature families. The honeybee and other social insects provide the clearest example of kin selection. They are also particularly interesting examples because of the peculiar genetic relationships among the family members. Male honeybees (drones) develop from the queen's unfertilized eggs and are haploid. Thus all their sperm will contain exactly the same set of genes. This means that all their daughters will share exactly the same set of paternal genes, although they will share — on average — only one-half of their mother's genes. (Human sisters, in contrast, share one-half of their father's as well as one-half of their mother's genes.) So any behavior that favors honeybee sisters (75% of genes shared) will be more favorable to their genotype than behavior that favors their children (50% of genes shared). Since that is the case, why bother with children at all? Why not have most of the sisters be sterile workers, caring for their mother as she produces more and more younger sisters, a few of whom will someday be queens? As for their brothers, worker bees share only 25% of their genes with them. Is it surprising, then, that as autumn draws near, the workers lose patience with the lazy demanding ways of their brothers and finally drive them from the hive?